As you know by now, here at Jetpets we are passionate about rescue pets. That’s why we were excited to hear from Anne at the RSPCA NSW about some recent rescue success stories! Tinkerbelle (now named Belle and pictured far right) and Sandy (now named Essie and pictured right) were transported from Sydney to “Rescued With Love” in Melbourne in April. Kae from Rescued with Love kindly offered to take on these two girls which they affectionately named the “Button Sisters” as they were cute as buttons! Both girls had severe skin infections due to neglect and were in need of some TLC and time to recover before they could be desexed and eventually rehomed. Kae has been taking wonderful care of these 2 girls and their progress can be seen on the Rescued With Love Facebook page. 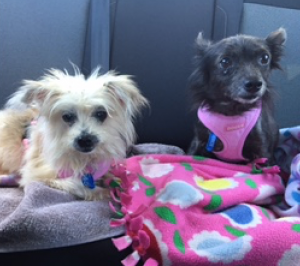 DeDe (pictured right) was originally at the RSPCA’s Shoalhaven Shelter where she was fostered with her brothers and sisters. 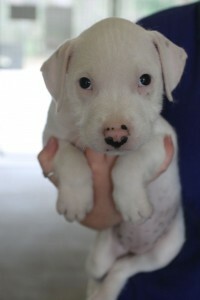 A few of the litter were actually deaf so finding the perfect home was a little trickier than usual. DeDe was spotted on the ‘adoptapet’ website by Pam who lives in Melbourne. Pam had been searching for the right dog for awhile and finally found DeDe. She contacted the RSPCA Shoalhaven Shelter and had a long discussion with the manager to figure out if she was the right person for DeDe. Of course she was the perfect mum and we arranged DeDe’s flight down to Melbourne to her forever home!